Im looking for a freelancer capable of designing a business card and website for my new company but we would like to work on the business card with the freelancer and see if we are compatible to also do the website for us. We are building a new studio for music/audio, video and photo productions for businesses and artist. Publishing and Marketing will also be a part of the business and could be used in the back of the card along with contact information. Would like the card to be in a similar color/foil design as this contest winner and other sample listed but can be varied to your taste as an artist. 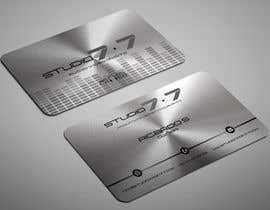 The company name is STUDIO 7.7 contact information. Owner: Ricardo S. Orlando FL 4075015152. We have not decided on a domain name but you can use [login to view URL] for the mean time. Feel free to email me if you need any further information. Thanks for your time and help. Please add the Words AUDIO/VIDEO/PHOTO under studio 7.7 in the front and would like to see the use of some modern fonts and design to the design of the "STUDIO 7.7" and would like to see if the words Productions/Marketing/Publishing in no particular order in the back of the card's logo or other location would look but we don't want to overload the card if too much. Thanks for your entries! please check my entry #37,#38. Do you have a logo that you would like on it?